Last Wednesday (March 3) was the Hina-matsuri in Japan. 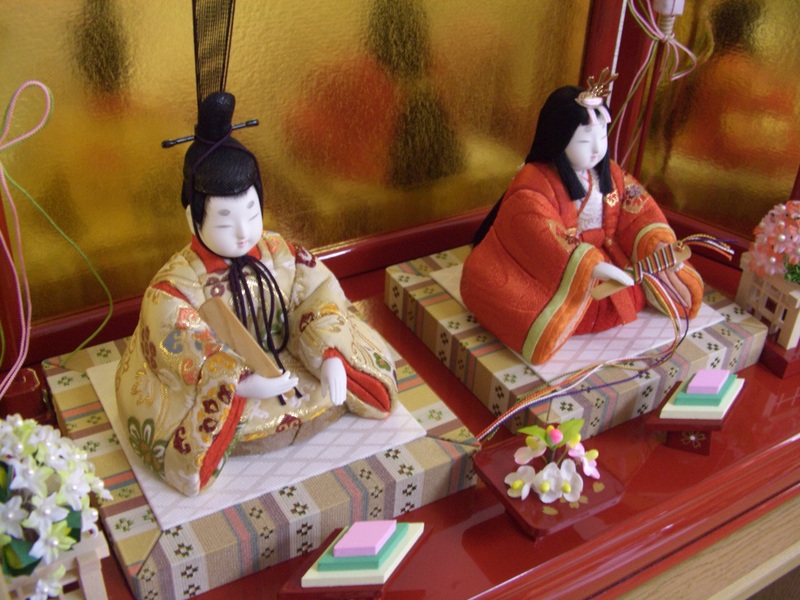 Hina-matsuri (usually translated as “Doll’s Festival,” sometimes “Girl’s Festival”) is celebrated by setting up a display of dolls in the house by families that have female children. Since our daughter is going to celebrate her first birthday in May, my wife was keen to buy a doll set this year to get her started on the path to girlhood (or, ah, something like that, I guess). Luckily, we were extremely spoiled by her parents, who gave us 60,000 yen (about US $660) in order to buy a nice doll set for our daughter. The problem was that nearly everything was well above that, with most in the 150,000 to 200,000 yen range (from US $1660 to $2200). The full seven-tiered platform set up you see on many pages about the Doll’s Festival was on sale in nearby department stores for the eye-popping price of 1,800,000 yen (about $20,000). We even looked at ittou-bori (一刀彫 Nara-style hand-carved wooden dolls), which were, of course, even more expensive. (There’s little info on the ittobori style available in English and even fewer pictures. You can see a picture of one from the Nara Essential Sightseeing page.). Eventually, we decided on a two-doll set (called “Dairi-bina”) in which the two figures represent the Emperor and Empress and comprise the top, or “innermost,” tier of the complete doll set. The asking price was 108,000 yen (about US $1200); we got them to agree to a reduced price of 80,000 yen (about US $885) because of the date: March 2. The “festival” was the next day. My wife really wanted this set because of the hair style, which was Heian (790 to 1185) rather than the more typical Edo (1603 to 1863). I’m not too entirely sure why this doll set is so important for little girls to have. I gather that the “Empress” is supposed to represent the girl herself, and that traditionally families with girls would ask the dolls to guarantee their daughters a good “catch” once they became wedding age. In other words, like Western countries, Japan, too, has had its share of little princesses. The “Boy’s Festival,” on the other hand, is celebrated by putting carp streamers outside your house and also by getting an equally expensive display set consisting not of dolls but of a helmet, sword, and sometimes armor. For a more extensive history of dolls in Japan, here’s an interesting summary. We took several pictures in front of the doll set together with our daughter, who had just turned 10 months old a few days prior. Well, I should say that my spouse and I celebrated that way. My daughter, on the other hand, celebrated by regurgitating partly digested food all over herself, her chair, and her parents. She then slept less than two hours before waking up and refusing to go back to sleep until 5 in the morning. Her first real sickness: a stuffy nose, with a strong cough, which she then passed on to us. Guess there’s no “Recovering from Cold Virus Doll” for baby girls. Too realistic and practical, maybe? This entry was posted in festivals, parenting, roles and tagged child care, Doll's Festival, dolls, Girl's Festival, hina matsuri, Japan. Bookmark the permalink.